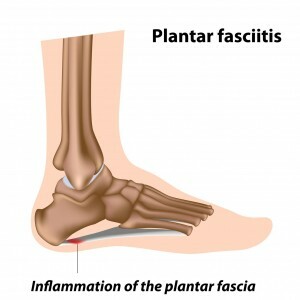 Common running injuries in the foot are discussed in this article. Running and jogging are excellent forms of exercise, but they subject the body to considerable stress. Each time a runner’s foot hits the ground, for example, it generates forces equivalent to at least three times the body’s weight. It is important to do everything possible to protect the feet, ankles, knees, hips, and lower back vertebrae. With proper technique and the right equipment, running can actually help relieve pain in the joints. Good running sneakers are essential to prevent common running injuries. The best running shoes have excellent cushioning and provide stability and support to the arch of the foot. These shoes should be replaced every 3 to 6 months. Running and jogging can lead to serious common running injuries that affect the legs, ankles, and feet, including heel pain, Achilles tendonitis, sesamoiditis, and tarsal tunnel syndrome. Another common running injuries in the foot is shin-splints. The term shin-splints is often incorrectly used to describe any pain in the leg between the knee and the ankle. The lower leg consists of three compartments, and which muscles are injured and causing the pain determines the proper treatment. Shin-splints occur a few inches below the knee on the medial (inner) side of the leg. The pain is located in the posterior tibial muscle/tendon. This muscle starts below the knee on the tibia, wraps around the inside of the ankle, and attaches to the underside of the foot. This route causes a pulley-like action that generates considerable force at either end. If a person runs too much, or if the feet are not working correctly, the muscle can become overstretched and pull excessively at the point where it attaches to the tibia. In most cases, the cause of this excessive muscle stretching is hyperpronation (i.e., a flattened arch). This causes the foot to lengthen and the posterior tibial muscle/tendon to stretch. A custom-molded orthotic device can be placed inside the shoe to support and stabilize the foot and prevent the arch from flattening too much. When walking, the muscles in the front of the leg help slow the forefoot after the heel strikes the ground. If these muscles are weak, the foot slaps the ground with too much force because the forefoot is not slowly lowered. When a person is running or jogging, these muscles have to work harder to prevent the forefoot from hitting the ground with excessive speed and force. These muscles can become overworked, leading to pain. This pain, which occurs in the front of the leg, may be incorrectly referred to as shin-splints. It occurs when the muscles in the front of the leg are overtaxed. It is common in people who run on hills or uneven surfaces. The swelling and pain of anterior compartment syndrome is treated with ice, stretching, and proper footwear. The pain associated with lateral compartment syndrome occurs on the outside of the leg and in the ankle and results when the foot is too flexible, causing the arch to flatten excessively. It can be treated with orthotics that stabilize the arch, providing necessary support. For more types of sports and running injuries including achilles tendonitis and turf toe see our page on sports injuries.